Whilst many of the teams heading into the upcoming Mid-Season Brawl have been surrounded with uncertainty, one opinion has reverberated consistently amongst players, pundits and the community: Team Dignitas are looking strong—really strong. I caught up with the team as they entered the final stage of their preparations to discuss their chances, the game in general, HGC, and all things HotS. Right off the bat, what would you say are your chances for the Mid-Season Brawl? Who do you feel is your strongest competitor? Is there anyone you are particularly looking forward to/not looking forward to playing? Why? Snitch: I think we are confident we can have a solid performance at the MSB. We are currently aiming just to take it one step at a time: succeed in the opening group stages and place in the winner side of the double elimination bracket, as we do not want to get ahead of ourselves or focus on high goals but more just look to do the best we can as a team. We are definitely looking forward to playing against the Korean teams the most, but playing against any international team is always fun as you get interesting drafts and game styles being developed due to the clashing metas. What would you personally say are your biggest strengths and weaknesses, individually and as a team? Snitch: I think our biggest strength as a team is that we are five mechanically strong, individually thinking players. This allows all of us to make our own calls and plays above the level of other teams. This can be a double-edged sword however since it requires us to have very crisp and tight communication to make sure we are all on the same page. However, throughout our recent practice our synergy feels at the best it has ever been, so I believe we are confident in our own game style for the international stage. Snitch’s comments have been echoed a lot in the community. Almost every MSB prediction, whether official or just as an offhand comment like in Tetcher’s Reddit AMA has labeled Dignitas a force to be reckoned with. They proved it in the regular season too by closing it out with a simply phenomenal 40-8 map record. It was clear that they only improved as the weeks went on too. They dropped their only series in the first half of the Phase but closed it out the second half with a 7-0 series score and 21-4 in maps. Should they carry this form on—or perhaps even improve on it—they will no doubt be a scary presence in the upcoming matches. You and Zaelia have recently expressed that they feel competition within EU is somewhat limiting their own development and have been adapting preemptively to meet the Koreans. Do you feel the Koreans are currently stronger in general than EU, or are they lagging a bit behind compared to how dominant they used to be? I didn't see enough in the Eastern Clash to suggest that the Koreans are still a step ahead. Snitch: I don’t think we can be confident saying we are stronger or weaker than the Koreans before playing them, as it has gone both ways in the past. I think when we discussed adapting to the way the Koreans were playing, we were mostly talking about understanding and incorporating their meta into our own, and we definitely found pieces that we liked and we still play a lot of them today. I think it goes both ways, as for sure at the Eastern Clash we saw a lot of compositions and playstyles that looked very similar to ours from the Western Clash just before. I think it’s natural that the top teams of each region will look at the top teams of other regions for inspiration when they feel like they are struggling to innovate. But what of the game itself? There have been several complaints about the meta being stale in recent months. Dignitas has often been a team to shake things up a bit and draft new things. For example, JayPL was a big part of the Stitches revival last season, this season we have seen the Aba solo support utilized, and Snitch continues to show that Falstad is more than relevant. In NA, Heroes Hearth made big gains with Rexxar and Li Li among others, and in KR there have been victories for Ana and Probius. Since then, we’ve had several substantial balance patches since the end of the last HGC matches, along with the release of Deckard Cain and reworks of Diablo and Lunara. The meta will definitely shift. Of course, Dignitas couldn’t reveal any of their own drafts going into the tournament, but they did offer some insight on the state of the game in general. Win rates show that a lot of popular competitive picks are quite low while a lot of non-standard picks are high. Do you feel that the meta is a force of habit rather than a reflection of the actual strength of heroes? It seems that teams don’t want to risk moving out of their comfort zones. Snitch: I think looking at winrates in a vacuum can be dangerous when it comes to balance or concluding how strong a hero is. The meta is generally a top-down ordeal. It starts from the teams at the top, they beat the teams in the middle who copy them, and they beat the teams at the bottom who copy them. Over time it may become diluted as teams don’t truly understand why certain compositions or strategies work and just try to copy them. Because of this, you’ll see lower teams trying to emulate what the top teams do but maybe not finding success because they are playing the heroes or compositions incorrectly or at the wrong time. This can change the overall win rate of certain heroes and make them look worse or average even though they are picked a lot. I think there’s no real case where teams are scared to move out of their comfort zones, it’s more just a lot of these riskier strategies aren’t consistent, so it’s not always a great option. Without giving anything away, how much do you see more unusual/off meta picks in scrims? Do a lot of teams like to try uncommon picks but then get cold feet in competitive matches? Wubby: I think HotS is only played in its true form during scrims and tournaments. The way some people innovate the drafts to win a game is what never gets me bored of HotS. I feel like the HGC system punishes risks, and teams always want to play safe for the extra points with a 3-0. I enjoy a group stage system and even an upper/lower bracket like MSB; that’s when we hopefully will see teams willing to take risks. Fnatic got away with a few wins earlier in the season by simply going all-in on the core and bursting it down. We have seen the success of compositions like Abathur/Samuro being able to absolutely annihilate structures, including the Core, in a matter of seconds, and we have seen games ended or rendered close to ended with a substantial late game minion/catapult wave. From both a competitive and casual standpoint, do you think that the core/keeps/all structures should have increased HP and/or damage? Perhaps a change like adding 5%/10% shields to the core for every fort/keep still alive? Snitch: I think for sure it can feel very harsh to lose a game in the late game after one fight with a team being able to blow through whole lanes of structures and the core before you get a chance to respawn and get back out on the map. 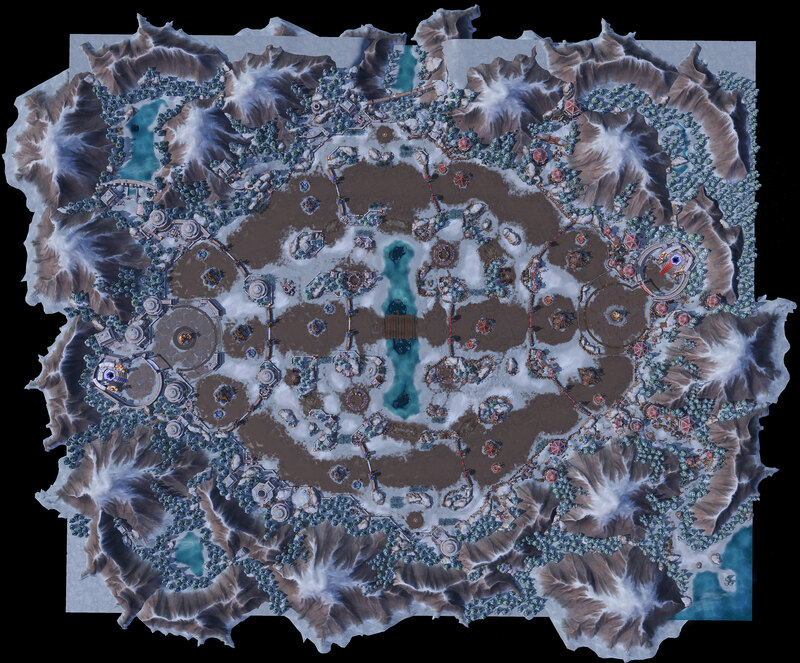 I think there are definitely some good ways to counter this that Blizzard could consider, and perhaps making the core stronger for each remaining structure is one of them. On the other hand, though, it can be very entertaining and exciting for viewers to watch such a comeback where a team is able to break through everything to take the win from a disadvantageous position, and it could be a shame to lose those rare occurrences. The recent announcement of Alterac Pass with its unique core mechanics has definitely gone some ways into changing the way games can be ended, and initial feedback from the map has been positive. Blizzard hinted during the announcement that they are testing things such as the aforementioned core/keep mechanic, so more changes could be in store. As Dignitas has behind been some of the most legendary comebacks in Heroes history, do you feel the game should be easier/harder to gain strong leads/comeback later on? Snitch: I think the game is currently in a very nice state in terms of comeback mechanics. To make a comeback from behind two levels or so, a team has to have perfect execution on an engage or a very smart rotation to get a pick, even more so when they are behind a talent tier. These sort of plays are normally the hardest to do, and I think they are rewarded fairly when a team is able to make a comeback in this sense. The tournament formats and infrastructure have been called into question as well, with all but one major team failing to make it through the Crucible. Almost all regions went through their own rosterpocalypse in recent weeks too, yet the teams have to practice and compete in the MSB with their old roster despite already confirming transfers. The Dignitas boys were happy to offer their feelings on these issues. What's your opinion about all the roster swaps and drama? Would it be better to keep rosters locked until after the tournament and have a longer gap before the start of the next Phase? What steps, if any, should Blizzard take to further support/protect the scene and players? Snitch: I think everybody agrees that, in a dream world, the roster swap schedule should be placed after international events such as the Mid-Season Brawl. Sadly, I think it is a hard problem due to the way the HGC is scheduled around specific offline events such as IEM Katowice and Dreamhack Summer. Maybe in the future it would be possible for Blizzard to have more arenas like the one in the US to allow them to schedule the format better for the players. With so many Crucible matches resulting in failure for the Open Division teams, do you feel that the structure of the Open Division should be improved? There's a sizeable amateur setup in EU at least with Heroes Lounge, and one imagines there could easily be a system more like the Bundesliga in German association football—a premier division and a second division with an automatic promotion/relegation spot and a playoff to determine the second promotion/relegation. Snitch: I think it is just very hard for Open Division teams to prepare themselves for the level required to attain the HGC. I don’t think it’s necessarily a matter of skill, as there were a lot of skilled players in our Crucible in EU this time, but perhaps more that they struggle to maintain discipline to scrim actively or find appropriate high level partners. I personally enjoy the format of the Crucible currently and think over time as players filter in and out between HGC and Open Division, it will be more likely that teams are able to qualify over the defending HGC teams. Regular league matches with more rewards would also promote playing the game competitively as a genuine option for teams not yet in Premier. Would this be a better solution? Is there a different alternative you have considered? POILK: As someone who has played through Open Division, the format that we played was incredibly painful. Just playing a best-of-3 single elimination bracket over two days every two weeks was really tough when things didn’t go your way, and you had to wait two weeks to have another shot and get your revenge. I think having the cups every week makes it a lot better for people going all-in to make it into HGC. I’m not sure about the rewards, though. I guess loot boxes for people who continue to sign up and play for cups should be rewarded in some way to make it feel more rewarding even if you don’t get so far in the cups. Blizzard have recently announced sizeable changes to competitive play, such as the third ban and implementing MMR decay. With Performance-Based Matchmaking returning soon as well, what do you feel the game still needs on a casual and competitive level? JayPL: I think a better replay system is really needed. It’s kind of painful to analyze replays at the moment. Due to the bad replay system, sometimes people don’t even take the time to use it. A spectator mode like in DotA2 would be really sick because it would probably bring the community together and maybe make players stop griefing and be toxic as they are being watched? Last, I wanted to do some individual questions. Snitch, you have been #1 GM with a record breaking amount of points this season. How much do you think Hero League is genuinely good practice? What in HL needs to be better? What's the best way for a budding competitive team to practice and improve? I personally believe that Hero League is very important to reach your full potential as a player. I think if you look at a lot of the standout players at the top of HGC you will likely find they are just spending more time spamming the game than other players. I think of course Hero League could be of a higher level and more competitive, but I don’t know the nuances of how to fix the matchmaking or how difficult a task it is. Regardless of the level, I think it’s impossible to argue that with a good mindset (being one where you’re aiming to improve) and a commitment to grind, any player can benefit from playing a lot of Hero League. I think the best way to improve as a new team is probably just to try and play together as much as you can, be it in scrims or if not possible just Team League, and try to put egos aside and be honest with each other. It’s very hard to improve as a team together if you are clashing because people’s egos get hurt. Everyone just has to have a mindset of wanting to win and trying not to take any criticism at a personal level, but for the benefit of the team. JayPL, you've been a top warrior in the game for years now (though I still remember you playing Sylvanas). Tanking has some of the most subtle elements to it at the higher levels that many are not aware of, such as the importance of anchoring and vision. If you had to give one piece of advice to a player about being a good tank, what would it be? The most important thing for a tank at higher levels is probably knowledge. First, you have to be on point with rotations, as you are the front line. You need to pass on all the information you can get and act accordingly to that and take aggro/defense/deeper/safer/more neutral position as necessary. Your goal is to provide the best and safest environment for your teammates so they can have a stressless macro game. Second, as every player should learn, is to have a large knowledge about the comp you’re playing and the opponents’. Using all of this information, you will have to think about how you should approach teamfights, when to engage, to peel, etc. Third, it’s all about using your abilities efficiently depending of the situation. Some tanks have a lot of interrupts. Stitches’s hook for example can even interrupt a clutch Sanctification, Sound Barrier, Twilight Dream, and a lot more. The same goes for ETC with W against Muradin’s jump, Genji’s trait, etc. There are also things like using Avatar with Muradin at the last moment to bait a Genji E/Li-Ming who wants to get the reset and ends up dying. Mechanically, there’s a lot of little things which will make you have better control in the early game and clutch teamfights. Zaelia, you have gone from a ranged DPS to off tank to support, and each time you've made game-winning plays. Do you have a favorite moment of your own play that has stuck with you? What's the most satisfying thing about playing a support? Do you miss carrying with Li-Ming and Tracer? I don’t seem to remember many of my “own” plays. I think the plays requiring synergy and teamwork are the ones that feel extremely rewarding, and they’re the ones that’ll stick around as wonderful memories. Coming together and making things happen that are only possible because of the synergy between us is just amazing. A few things coming to mind are back on Ragnaros: the Ley Line into Molten Core against Team Liquid at the first Western Clash and the Stitches into Smash against Fnatic are both insane displays of synergy and decisiveness as a team. On support, I remember one time against Tricked eSport on Infernal Shrines as Malfurion, Wubby and Jay had just died and we were retreating, but a few quick words on comms with POILK and Snitch—and boom, we find a big Twilight Dream opening and the followup is instant. It was a beautiful 3v5 turnaround that led to winning a game that was about to turn hard and sour, easily. I don’t quite miss the feeling of “carrying”, no. Li-Ming and Tracer do have a special place in my heart though, and I do miss just having fun on them, finding plays and outplaying my opponents. That’s initially what drew me to the game and it’ll probably always be my go-to in Hero League when I just want to enjoy myself with the game. I shouldn’t understate the feeling of watching POILK do incredible things with those exact heroes either. It feels good to do these things yourself, sure, but watching somebody execute things that you know are just incredibly difficult from own experience, is fulfilling to a whole other extent. And I’m fairly sure I scream louder than anybody in the world when I see POILK do the dance and make magic happen. Wubby, you are often considered the best solo laner in the world. Solo laning is often underappreciated since a cast will rarely focus on it, so a lot of the art of being a good solo laner is lost to the community. What would you say is the most important thing about being in the solo lane? How do you put yourself above the rest of the competition in those matchups? Do you relish the prospect of an intense 1v1 in the solo, like if you were to face Rich in the MSB? Do you ever get bored of Dehaka? Since the change of turrets where they no longer have ammunition, the meta of the solo lane has changed a lot. It’s less about winning the lane and pulling attention from the other lanes. Now it’s more about having good wave management so you can have the better timing for roaming away from the lane for an objective or even gank. A weakness of many solo laners in top teams right now is when you have to win the 1v1 matchup. Most of them are people who role swapped and didn’t have the chance to learn all the specific matchups. So if something like Leoric vs Sonya has not been meta and is played for the first time in scrims, you can feel the difference in player skill. Whenever I feel bored of Dehaka, I change the color of my skin and then it FeelsGoodMan again. POILK, you endured some criticism after first coming to the team, but no one doubts you now. You've shown a lethal touch on a variety of heroes, but are there any you wish you could bust out that just don't fit into competitive drafts much? Are there any you really resent playing? I wish Probius was viable in competitive play. It’s a very fun hero to play, and he has a fun kit. There isn’t really a hero (from the ranged assassins) that I resent playing. There are some heroes like Fenix that I don’t really enjoy playing because of his big hitbox—it feels very clunky. But I still do play it since it’s my role. ALL: And of course, any final comments, shoutouts, parting words? Snitch: As always, a huge shoutout to Team Dignitas and our sponsors, as well as our fans who are always supporting and cheering for us. We are excited to perform at the Mid-Season Brawl, and we hope we will be able to make you all proud by achieving a good result. Look out for us at the event! You can watch Dignitas and the rest of the world’s best competing at the Mid-Season Brawl from June 9th-June 18th.